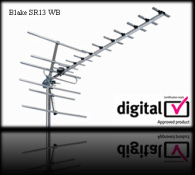 A Standard Digital Aerial Installation comes with a 2 Year Guarantee on All of our Aerials. Enjoy over 200 TV Channels with No monthly payments. There are a few ways in which you can watch TV in different rooms of your home. We can help you find which one is right for you. Having Problems with your TV signal? Can't receive all of the channels? Need extra TV points in your home? Fancy Upgrading your System, but not sure what to go for? Give us a call, which ever it is we're here to help!